Author of Wooden Boats and Iron Men, Trygvie Jensen grew up on Washington Island and came from a commercial fishing family. The inspiration for this book derived from the memory and spirit of Trygvie’s great-grandfathers Oliver Bjarnarson and Harry Hagen. Both were commercial fishermen at Washington Island, which during its zenith was the dominant industry in Door County. Many commercial fishermen were born into the business, carried down from generation to generation. At a young age they helped out at shore duties, eventually accompanied their fathers on the boats learning the craft first hand, assimilating into a way of life that proved to challenge one’s physical and mental strength. “It’s not the easiest life, but it’s the only life as far as I’m concerned,” says one old fisherman. Commercial fishing is often a demanding job both mentally and physically, where a fisherman is challenged by many fronts, especially that of the dangers out on the lake. In 1984 the U.S. Coast Guard stated that commercial fishing was the nation’s most dangerous profession, with a death rate seven times the national average for other industries. 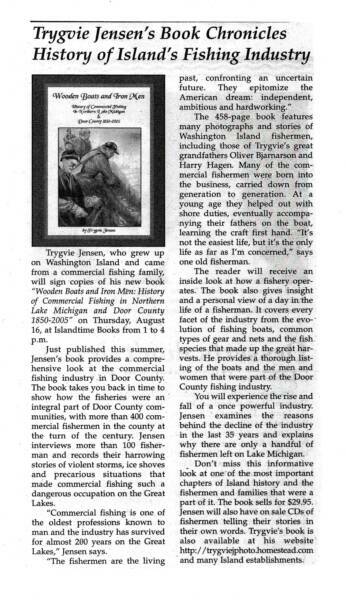 Wooden Boats and Iron Men takes the reader back in time to show how the fisheries were an integral part of the Door County and Washington Island communities, and will give an inside look at how a fishery operates. It also gives insight and a personal view of a day in the life of a fisherman. It covers every facet of the industry, from the evolution of the boats, common types of gear used in the last one hundred-fifty years, the species of fish that made up the great harvests, and the invader species that almost wiped out the industry in the mid to late part of the twentieth century. The data for this book was compiled through several hundred hours of research through various personal interviews with fisher families, history gathered from archives, historical societies, books, published and unpublished manuscripts, databases, periodicals, and online sources. It has truly been a labor of love for the author, who is currently working on a follow-up book to Wooden Boats and Iron Men called Through Waves and Gales Come Fishermen’s Tales. Trygvie Jensen’s book Wooden Boats and Iron Men may be purchased at his website, http://trygviejphoto.homestead.com and at all Door County bookstores. The last person you'd think would be writing a book about the history of commercial fishing in Door County is a building inspector in De Pere. The first person would be someone who grew up on Washington Island and was weaned on stories about the rugged individuals who confronted every mood of Lake Michigan to get the fish that provided a living. Both men are Trygvie (Dennis) Jensen. He spent the first 12 years of his life on Washington Island, enough time to be indoctrinated to a way of life that kept his ancestors alive. Both of his great-grandfathers, Oliver Bjarnarson and Harry Hagen, were among the 400 commercial fishermen who plied their trade on Lake Michigan 100 years ago. Today, the number of commercial fishing businesses in Door County can be counted on one hand. That's exactly why Jensen decided it was his calling to record the stories. He wrote a book, "Wooden Boats and Iron Men," that traces the history, myths, dangers and people who chose a profession that the U.S. Coast Guard announced was the nation's most dangerous in 1984. "It was so important to me to preserve this history," said Jensen, 41. "Nobody really understands how precarious it was." Jensen first thought about chronicling the commercial fishing history while talking with his grandfather more than 10 years ago. As he saw the industry dwindling and the years beginning to take their toll on the men who fished, he decided that if a book was going to be written, it had to be written soon. And if anyone was going to write it, he was that person. "I taped about 150 hours of interviews," Jensen said. "I'd write early in the morning and late at night so I still had time for my family." He also went fishing. Jensen spent one February day with the Hickey Brothers of Baileys Harbor as they lifted their nets and retrieved the chubs despite high waves and wind. Jensen remembers that because he spent part of it curled up in the fetal position, concluding that death would be easier than spending any more time on that boat. "All I could think of was the Beach Boys song, 'The Sloop John B,'" Jensen said. While the tales of the fishermen became the personality of Jensen's book, the declining commercial fishery was a dominant theme. There was the loss of the lake trout because of the invasion of the lamprey eel in the 1950s, then the rise in sport fishing in the 1960s that included more restrictions on the commercial fishermen. Now there are even more threats from invasive species. Jensen pored over archives in museums and interviewed dozens of people. With each interview, there was greater admiration for a culture that the general public knew only through the fish platter. The book took Jensen almost two years to write and left him with a thirst for more. The fishermen tales that didn't make it into his first book will be the cornerstone for his next one, "Through Waves and Gales Come Fishermen's Tales." The first printing included 1,000 books, many of which were being marketed in Door County. A second printing is in the works. It's our history and it's dying before our eyes. The potential for commercial fishing was the magnet drawing many early permanent settlers to the Door County area. Ever since, the Door County commercial fishery has remained very important. Trygvie Jensen, a Washington Island native, has provided a comprehensive history of this significant local industry. 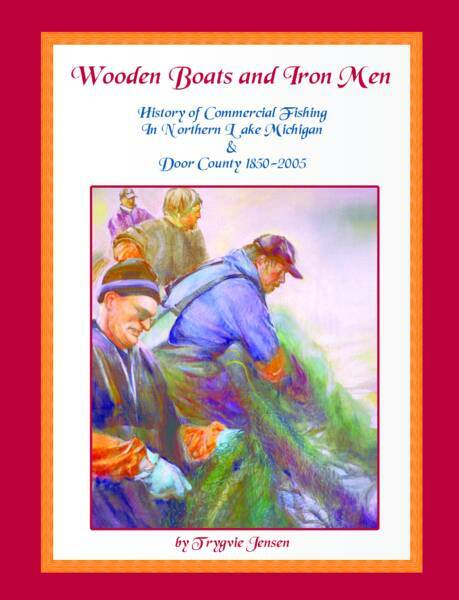 His book Wooden Boats and Iron Men: History of Commercial Fishing in Northern Lake Michigan and Door County 1850-2005 details in a most informative and understandable way the long, proud history of this dangerous but rewarding economic activity. 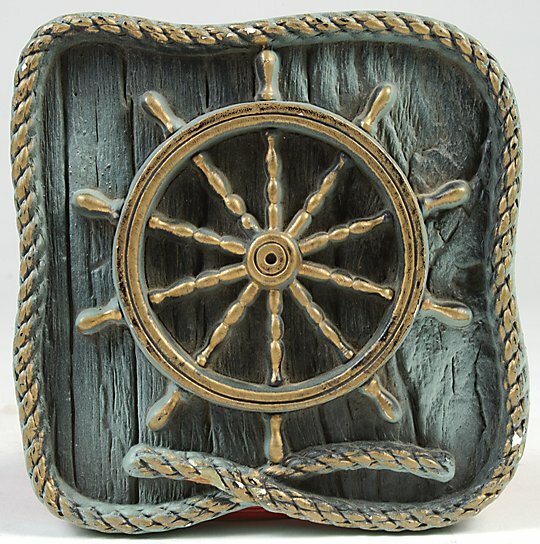 Most of us are generally familiar with the end product of commercial fishing – the fish. Who has not had a tasty whitefish dinner, for example. However, how many of us have even the slightest inkling about the process that produced that meal. Not to worry. Jensen provides us with the specifics necessary for a good understanding of the basics of this complicated activity. Jensen divides his book into three related parts. Part I is “A General History of Commercial Fishing in Lake Michigan.” After a chapter devoted to an historical overview of the rise of commercial fishing in his study, Jensen turns his attention to those basics of fishing. In successive chapters he treats the fishing rigs, the commercial fish species, and ice production. These subjects are treated by relying on wide-ranging pertinent primary and secondary sources. These are complimented by informative quotes drawn from extensive personal interviews with those on the front lines – the commercial fishermen themselves. This is the case throughout the entire book. The author has a firm command of his subject and uses information provided from interviews to undergird his case. Part II focuses on the long and storied history of the Washington Island fishery. Jensen shines here. Every nook and cranny of his native island fishery is detailed. The sound basics of a journalism course are revealed by the author. The who, what, when, where, and why are covered with interesting fact, anecdote, and supposition. 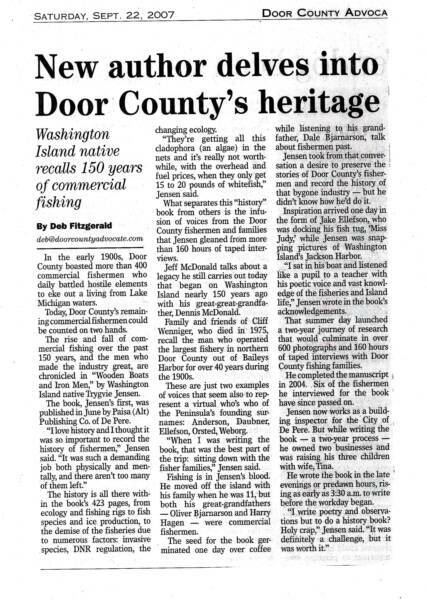 This is not only a history of fishing on the island, it is a virtual island genealogy of fishermen. This kind of detail impressed this reviewer. It is based on solid research. It is evident that the author paid his dues in doing the research necessary for writing an informed book. Part III turns our attention to the commercial fishing industry of a slightly different locale – northern Door County. In order, Jensen treats the same topics for the northern Door settlements of Gills Rock, Ellison Bay, Sister Bay, Ephraim, Fish Creek, etc. The detail we have been accustomed to earlier in the book is continued here. Attention to detail is a hallmark. As I read this book, I continued to be impressed by the attention to specifics, all supported by appropriate footnoting. Potential readers should not be put off by what might appear, at first glance, to be a lengthy book about a seemingly narrow topic. Jensen’s book is not intended solely for those interested in the many different facets of fishing. Here is a work that should speak to anyone with a broad interest in the many diverse aspects of the history of Door County. We do not need more general histories of this area. Instead, we need more good books, like this one, that treat in significant and meaningful detail an important aspect of the overall general history of Door County. In this regard, Wooden Boats and Iron Men compliments another recent addition to the local bookshelf, Bill Tischler’s Door County’s Emerald Treasure, a thorough history of Peninsula State Park. Books like these are most welcome. Authors interested in writing about Door County would be well advised to follow these models in treating other topics that make up the complex history of this area. It will take an extra effort, however to match the richness of specifics and overall completeness provided by Jensen about his subject. Charlie Calkins is a retired geography professor, a part-time Door County resident, and an inveterate collector of printed material related to the county. In his spare time he operates the Badger Bibliophile, a business specializing in buying and selling gently used Wisconsin books and maps. His wares are sold at several antique malls in the state, including the Peninsula Antique Center in Egg Harbor. E-mail him at wibooks@milwpc.com.